What is plaque? Plaque is a soft and sticky layer that builds up were the teeth and the gums connect. This plaque contains millions of bacteria which can lead to problems such as gum disease and tooth decay if not taken care off. Plaque can be kept under control by brushing and flossing on daily basis. 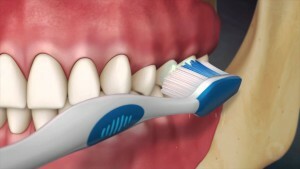 There are several techniques which a patient can take to make sure the plaque is under control. There are a variety of ways in which we can take hands on to help when it comes to having a good oral hygiene. Not only are tooth brushing and flossing the only way to help plaque removal but, the following are also ways in which we can contribute to help minimize the plaque in our teeth. Going a step further disclosing tablets are also very practical when it comes to controlling the plaque building up along the gum line or on the tooth surface. These disclosing tablets allow the plaque to become more visible to the naked eye. The plaque will usually turn a different color such as pink, blue, orange, any other bright color to indicate were plaque have been building up and to be removed by brushing. These tablets are very practical allowing you to be able to brush all the plaque that you can visually see with the naked eye. Brushing should also be accompanied by flossing on a regular. Flossing will help remove any food particles and dental plaque from the areas between the teeth which the toothbrush is unable to reach. Another way to help is by regularly using mouthwash to help kill bacteria that is being stored away. Going that extra mile for your teeth will most definitely pay off when having healthy teeth. Fighting against plaque can be hard but can be done if techniques above are being used. If plaque is not removed on a daily basis this plaque can harden and become tartar. If tartar continues to build up, gum tissue can become red and swollen and can possibly begin to bleed when brushing and flossing. This is called gingivitis and early stage of a periodontal problem, Gingivitis can be reversible with professional and a good oral hygiene but, if gingivitis is left untreated this can lead to an advanced periodontitis which can severely lead into a form of gum disease. Protecting your teeth and gums should be a priority as your health begins from your mouth to the rest of your body. The fight against dental plaque is yours help your teeth be in nice and healthy shape for them to last you a life time. This entry was posted in dentist, intraoral camera, plaque, santa ana, smiles on bristol and tagged dentist, dentist in santa ana, plaque, plaque control on August 1, 2016 by Francisco Torres. Local anesthesia is a type of anesthetic administered by the dentist to help prevent discomfort on an area of your mouth that needs dental treatment needed. (Some states allow dental hygienist to administer local anesthesia.) Many people fear or do not visit the dentist regularly because they are afraid of the anesthetic needles. They put their self at higher risk in developing major dental problems. Local anesthesia works by blocking the nerves that sense or transmit pain. Making the dental treatment easier on the patient without feeling any pain or discomfort. First, before any local anesthesia is administered the dentist will use a topical anesthetic on the injection site. The topical anesthetic is placed in the oral mucosa for at least one minute. The topical anesthesia will help eliminate sensation, making the patient feel less discomfort when the anesthetic is administered. Topical anesthetic can also be used to depress the gag reflex that occur when taking x-rays or impressions. Topical anesthetic can come in gel, ointments, liquids, and metered sprays. It is commonly found in gel form, and comes in different flavors. Injectable anesthetic comes in liquid form and it’s in a cartridge. 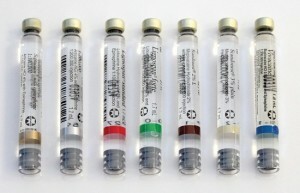 There are many types of injectable anesthetics, they are labeled with different color cartridges. Some anesthetics contain vasoconstrictor; vasoconstrictor increases the duration of the anesthetic. There are some types of anesthetics that contain no vasoconstrictor and the duration of the anesthetic is less than one with vasoconstrictor. 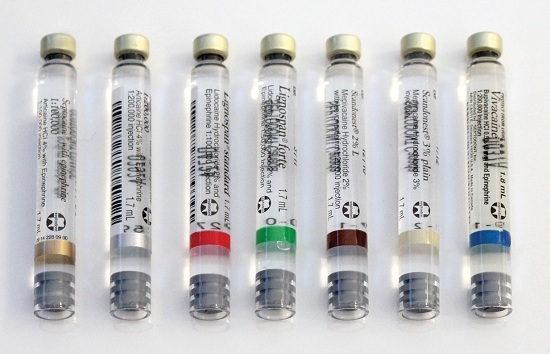 These are mostly used on patients with high blood pressure, and come in a light brown-labeled cartridge. Local anesthesia can be used for most dental treatment. Including dental fillings, root canals, crown preparations, extractions, and deep cleanings. There are some cases were your dentist will recommend sedation for wisdom teeth extractions. Local anesthesia can last from 3 to 5 hours so it’s very important to avoid hot foods and drinks, and avoid biting your lips and cheeks. This entry was posted in dentist, intraoral camera, santa ana, smiles on bristol and tagged dentist in santa ana, Local Anesthesia, santa ana dentist on July 13, 2016 by Francisco Torres.